All rugs are sold by the square foot, with an exception to Bas Reliefs. This includes fabric borders, custom, carpet borders, fiber-optic, all other insert styles, etc. Gino will supply a price list to Designers and Architects upon initial meeting. Designers, you have access to Fabrica and Masland, who are the two companies that make the best carpet for creating custom area rugs. You are in charge of ordering the carpet, Gino does not include this in his price given to you. Gino will supply you a cut list that will tell you what amount of each color and style to order of each piece needed. 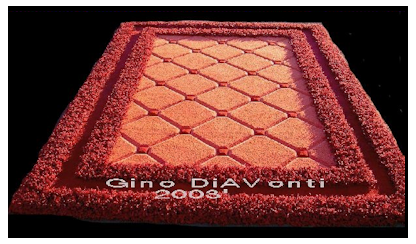 Gino&apos;s price includes assembly, carving, backing and binding of the rug. Carpet is paid for by the Client. Gino will supply the backing, binding and all other supplies (minus the carpet) needed to create the custom area rug. Shipping is extra. Gino will deliver the carpet himself to all local areas, which include Port Charlotte, Punta Gorda, Fort Myers, and Naples. This includes delivery right to the Client&apos;s house, and also installation. Heavier furniture will need to already be moved out of place where the rug will sit, so if you need this done, please have appropriate Workers there to move and replace this type of furniture. That would include heavy stone tables, and other such objects of this nature. Sofas, regular Coffee tables, and End tables are generally not an issue, and Gino and his Helper will move this type of furniture themselves. Custom area rugs are each priced specifically depending upon how much work/detail goes into the finished area rug. 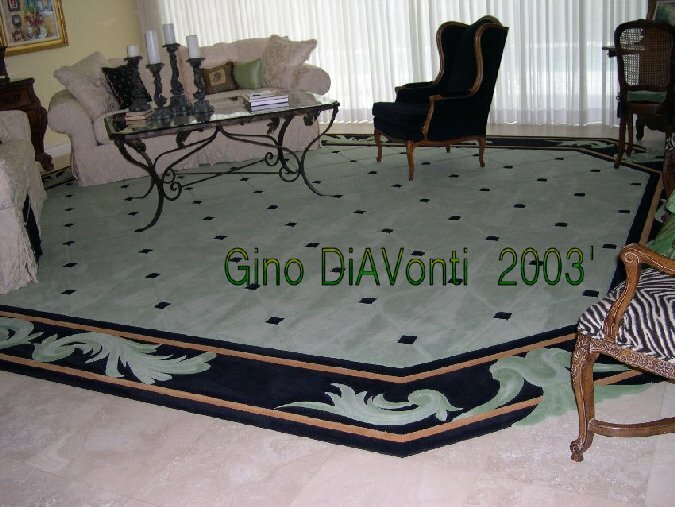 Typically, a Rendering must be done (or given to Gino) in order to price out these types of rugs. Call Gino for any other questions on pricing out these types of rugs. Custom rugs as mentioned here include those that are more than one color. The price includes assembly, carving, backing and binding of the rug. Carpet is paid for by the Client. Shipping is extra. Designer/Architect supplies the carpet. Gino prefers to work in Fabrica Chez (pronounced Shay), and highly recommends this for your choice in custom designed and carved area rugs. The reason for this is the carpet is a pencil-point, meaning each tuft is the size of the point of a pencil. It is very tightly packed, (similar to a high thread count in excellent, expensive bed sheets) and is a high pile. 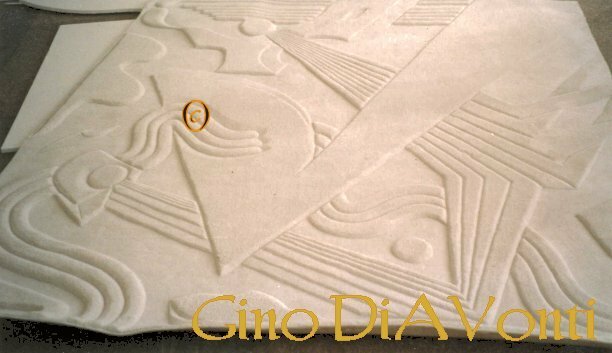 This will create a more distinct carving, which is the bold, dramatic look in a custom designed area rug that Gino finds the most appealing. He can also work in the Fabrica lines, Accolade, Dolce, Pacific Grove, and Madonna. The last four named are not quite as tall of a pile, but still make lovely custom area rugs, and may lend themsleves to more color varieties than Fabrica Chez (which has 100 colors!) Fabrica commercial lines can be used for border style rugs. Fabrica is located in California. They charge a cut-fee of 50.00 for any carpet ordered that is under 10 feet. Carpet is sold by the linear yard, (1' X 12' is a linear yard) You cannot change the length, which is 12'. That is how it is loomed. So as an example, if you need an 8' X 12, you will pay for 8 linear feet, (8 X 12 = 96 square feet) plus a 50.00 cut charge because the order is under 10' wide. Gino will make a cut list depending upon how many colors you need ordered. In this way he can save you as much as possible when it comes to ordering the carpet for your custom designed and carved area rug. Fabric border rugs are priced by the width. 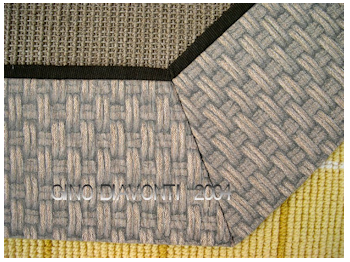 If you are a Designer, please consult the Custom Made Border Rug Sales Sheet Gino supplied you, or request one by contacting Nichole. The price includes assembly, carving, backing and binding of the rug. All of these supplies will be taken care of by the artist. Designer/Architect supplies the carpet. Shipping, if needed, is suppled by the Client/Designer. Gino will pack the rug for shipping, and deliver to appropriate local Carrier for you, at no extra charge. Bas (pronounced "baa", like a sheep's bleat) relief are some of the most difficult, yet beautiful, of all custom area rugs. They contain no inserts, but are completely carved. These exquisite rugs are also priced out depending upon detail. 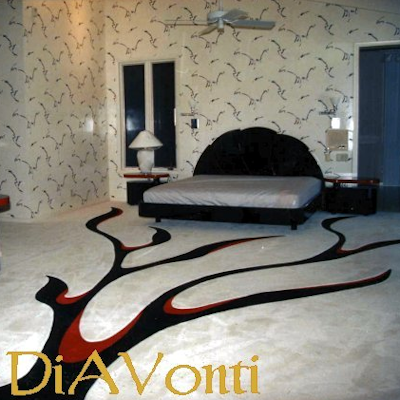 A Scale Rendering will be needed in order to price out this type of rug design. The area rug to the right is an example of such a rug. 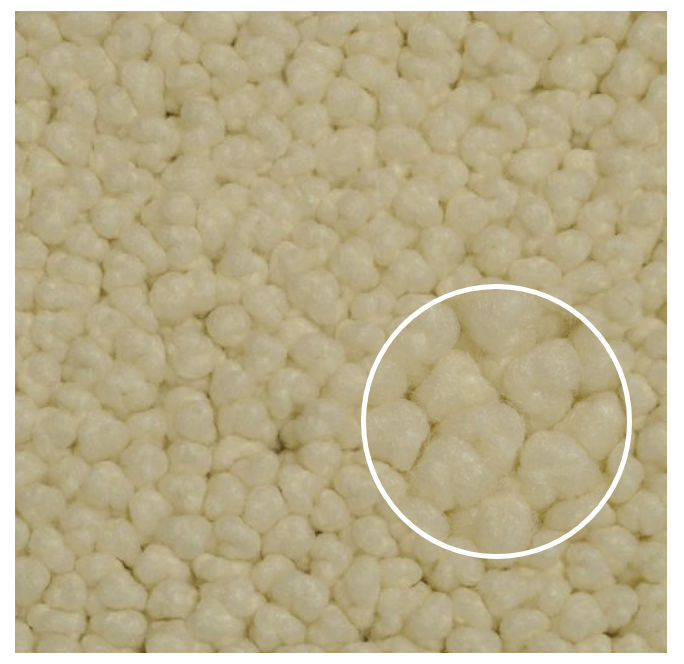 Fiber Optic rugs fall under the category of custom area rugs and are made of Fabrica and/or Masland carpet. The price for the custom area rug they are inserted into is separate, and will be priced according to the work involved. The price includes assembly, carving, backing and binding of the rug. All of these supplies will be taken care of by the artist. Designer/Architect supplies the carpet. Textured Custom Designed Area Rugs are very unique and add classy elegance to any room they sit in. Gino loves working in different levels and textures when it comes to making custom designed and carved area rugs. Pictured here is Maslands Reggae. Reggae resembles small knotted pebbles with another thin line of color running through the center of each knot in some of the choices. Really beautiful, you can click the link Reggae to view all of the 43 colors available. After reviewing the colors, you can email or call Gino for help locating the carpet for your perview in your city. To ship, Gino works with a local Profloors in Naples, Florida. It is much easier for him to pick up the carpet from Profloors. Ask for Mike, as he is familiar with Gino and the custom area rug orders. Mike will either match or beat the price your local company quotes you, so that you can order it through Profloors and have it shipped to them. Gino will pick up the carpet from them. They carry your Masland (oncluding Reggae) and/or Fabrica choices. Perhaps you want to throw a real leather or a cloth border on the custom designed area rug too? Just about anything you can dream up, Gino can create. He has even put high grade linoleum into carpets as a texture. Great for those of you with a flair for the ultra-contemporary in custom designed area rugs. This is an excellent example of a Custom Designed, Textured and Carved Area Rug. Notice how tall the Shaggy Chic red borders are. Gino then carved "tiles" into the pale pumkin carpet to give it even more flair. The Textured, Custom designed Area rugs are really something to see! Shipping, if needed, is suppled by the Client/Designer, via FedEx. Gino will pack the custom are rug for shipping, and deliver to the local FedEx for you, at no extra charge. The rug will be insured for 5000.00 value (FedEx limit) if possible; at the time of shipping, paid for by the Client. FedEx will call you at the time the rug is being shipped, for your credit card information. The custom area rugs usually weigh between 80 and 100 lbs, each. FedEx charges (as of 2019) between 330.00 and 450.00 dollars for shipment, (they go Freight/truck) depending uponwhere it is being delivered. Carpet border rugs with no inserts in the field are priced out according to amount of borders. Consult the Sales sheet Gino supplied you with. If there is to be inserts or carving done to the field, you will need to Call Gino for a price. A "to scale" rendering will be needed if inserts are added. Leather and Suede borders are also available to be created by Gino, and prices are listed on the Sales sheet he supplies. For any other changes, please Call Gino Leather and Suede are paid for by the Client/Designer. Any other inserts you may desire, such as the glass baubles seen on this website, Contact Gino for a rough estimate. You will need a scaled rendering plus carpet type details in order for him to give a deliberate price. Scale drawings are charged at the rate of $400.00 for up to 3 rugs. The price is to be paid in full before Gino begins the area rug drawings. The Renderings will take anywhere between 1 and 3 weeks to complete. Gino will color at least two sides of the drawing, and possibly more, to match already thoughtful carpet combinations. This fee is non-refundable. If the custom area rugs are ordered, Gino will take the $400.00 off of the total of the price to create the full size area rugs. The drawings will become the property of the purchaser. However, in order to create the rugs full scale, Gino will need to use the chosen rug(s) orignial(s) until it is created. At the finish time, he will give them to their proper owner. In the meantime, Gino will supply the Owner of the drawings with a copied set of the drawings. The drawings and colors, names of manufacturer of carpet types, must be hand signed off on the drawings by the Owner and the Designer before Gino will begin work on the custom area rugs.